News out of Washington is that the most famous man in uniform today, General David Petraeus, fell ill and fainted during testimony in front of Congress. Let’s hope the commander of CENTCOM recovers quickly. This news provides an occassion to tell two interesting stories in General Petraeus’ bio that some might not have heard. The first one is that, back in 1991, General Petraeus was accidentally shot in the chest and nearly killed during a training excercise. As the BBC explained, “one of his soldiers tripped and accidentally fired a round during a training exercise in 1991. 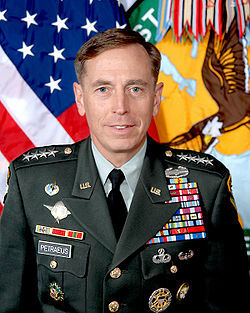 Gen Petraeus spent five hours in surgery, during which he was operated on by Bill Frist, who later became a Republican Senate majority leader.” The best part of this story is that the general wanted to be released right after the surgery and eventually was allowed to leave a few days later after doing 50 pushups to prove he was fit to go! The second is that he later broke his pelvis while parachuting when his chute collapsed 6 stories above the ground! It also worth noting that the general has a Ph.D. from Princeton University and published an academic article in a peer-reviewed journal long before he was famous – so a warrior and a scholar. Can I make a silly comment? The military should limit the number of ribbons one can earn to an amount that will actually fit on one’s uniform. It does look a bit silly and includes a lot of awards that aren’t exactly for Audie Murphy-like actions. The Navy has an old tradition of only wearing one’s “high three” – which is the right way if you ask me. However, few today keep up the tradition. But it is cool when you see someone only wearing the ribbons for a bronze star, a national defense service medal, and a campaign medal with star. Audie Murphy the recipient of the highest honor an American can get, The Congressional Medal of Honor, never walked with his chest full of Christmas tree ornaments the way Petraeus does. Did he ever actually see battle. And yes I’m a vet.